The Van Os family of artists were among the most influential Dutch painters at the end of the 18th and beginning of the 19th centuries. The father, Jan (1744-1808), and his son, Georgius Johannes Jacobus (1782-1861), continued the great Dutch tradition of still life painting while Pieter Gerardus continued in the footsteps of Paulus Potter (1625-1654), painting rustic landscapes. Pieter was born in The Hague on October 8, 1776 and like his brother, Georgius, received his early training in his father’s studio. His love of the Dutch landscape soon emerged and he broke away from the family’s still life tradition and began copying the rural landscapes of Potter, Berchem & Ruysdael. Through his meticulous copies, Pieter taught himself the art of landscape painting. During the early years of the 19th century, Pieter had a studio in Amsterdam and among his most notable students were Wouterus Verschuur (1812-1874), Simon van den Berg (1812-1891), Guillaume Anne van der Brugghen (1811-1891) and Jan van Ravenzwaay (1789-1869). In 1808 he had a son, Pieter Frederik (1808-1892), who would continue the Dutch landscape tradition through the end of the 19th century, not only through his own work, but through the work of his most important pupils – Anton Mauve (1838-1888) and Johannes Hubertus Leonardus de Haas (1832-1908). 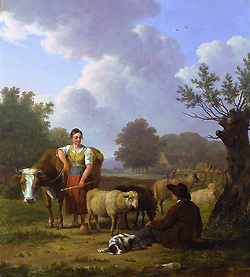 The Van Os family’s contributions to Dutch 19th century art cannot be overstated; through their landscape and still life works, they furthered the development of these great Dutch traditions and paved the way, through their teachings, for the new techniques and styles that would emerge. Pieter continued to work until his death in The Hague on March 28, 1839. Examples of Peter van Os’ work can be found in museums in Amsterdam and The Hague.